Dan was a fabulous professional instructor and guide for us!! It was our first snorkel, my husband and I, age 58. We can swim but no one would say we're strong swimmers hence we decided upon an instructor/guide, and Dan's the very best. We didn't plan to do the wet suits but thank goodness Dan had them available. It was low tide and the protection over the coral in shallow water was invaluable, besides the warmth and buoyancy it offered. (the water was a little cooler than we expected) Dan literally held my hand while snorkeling so i could simply relax and float and watch for fish. He guided us over coral I'd have never have done otherwise, and those were the best places to see the fish. He was so very patient and helpful as I suited up, he fitted my mask and fins, and he was very thorough explaining the snorkel, breathing etc. 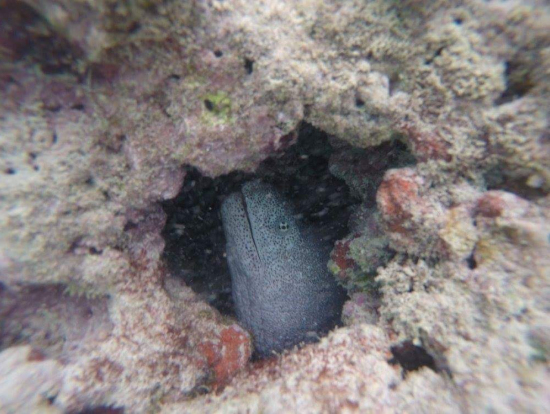 I'd have never had the same snorkel experience without Dan. He made us feel comfortable and safe, what more could you want? We had plenty of nice surprises-the tram down and back for example. He provided water and snacks afterward, beach mats, lock box for stuff while in the water, transportation, etc. It feels luxurious when someone's taken care of everything, Dan made that happen and I'm confident he would for you too. I can't recall the name of Dan's helper but she too was top notch. When snorkeling it's sometimes hard to know which direction you're headed, let alone the tide steering you. I don't really know how Dan and her managed to keep track of us, both above and below water simultaneously but they did, keeping us together, seeing and pointing out the best things possible during the snorkel. Dan wants you to have a great experience. You will, like we did, I'm sure. If we can do it (with Dan's help) you can too! PS Dan takes pictures of you for you. Can't wait to see ours! 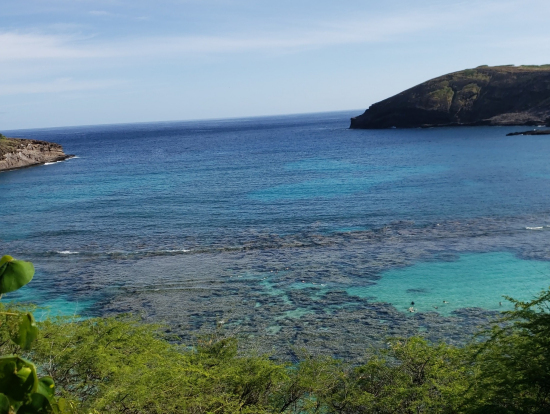 We have snorkeled at the circular-shaped shore of Hanauma Bay on the southeast tip of East Honolulu, you can imagine how this beautiful cove was once a volcanic crater. Today, this crater, likely flooded by wave erosion, is home to an important nature preserve and the island's most popular snorkeling destination. Our snorkeling trip was arranged by Hawaiiactivities.com and they were quite professional people with prompt responses and is very customer oriented. They arranged Mr. Dan to train us snorkeling. Mr. Dan is best instructor you can have in Honolulu as he explained every steps in a legible and understandable way. 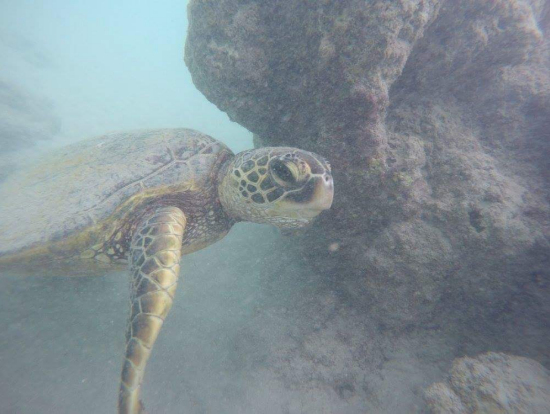 He has snorkled with us for many hours. Whether you’re snorkeling a natural or artificial reef, at the beach or along the mangroves, you’ll discover amazing underwater creatures. Look at (but don’t touch) the vibrant yellow and red coral canyons and purple sea fans swaying in the ocean’s current. Coral is actually alive and it’s extremely delicate. Touching coral is detrimental to its health and can also be dangerous. It’s actually related to the jellyfish and can provide a sharp sting, burn, or cut when touched. A good rule of thumb is to stay in water that’s at least six feet deep while snorkeling over coral. Look for tropical fish including yellowtail snapper, parrotfish, angelfish, blue tang, grouper, and hogfish. We have come across with Turtle who is is not afraid to swim with us. 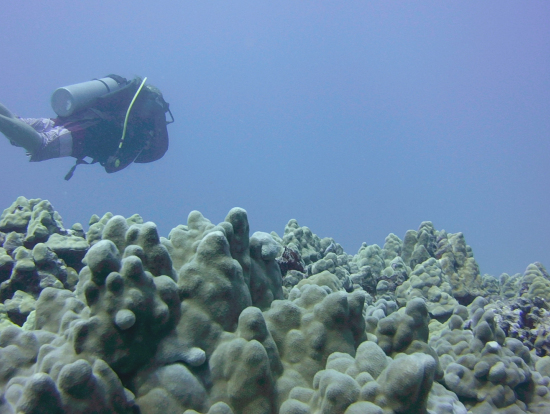 With such a thriving and diverse ecosystem, there’s nearly as much to discover underwater in Hawaii as there is on land! Dan took pictures with his under water camera. It was lots of fun. Dan brought snacks, drinks, etc. too. On the way back Dan shared lot of information on best shows and tours in Hawaii. We had a great time and will definitely go again if I'm ever in Hawaii. We were looking for a tour to see the North Shore but have the freedom to do what we want to do....we couldn't have picked a better tour. This is the perfect tour for people looking for freedom to do/go where they want. We had Sam as our tour guide, a native from Hawaii. He was informative and very the perfect style of guide for this tour. Knew what he was talking about, laid back but still detail oriented enough to handle everyone's activities and where they were. 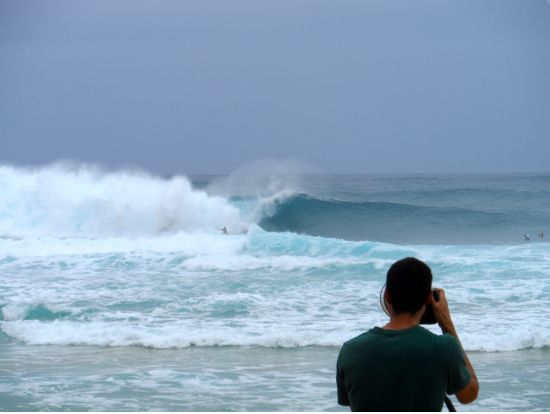 We went there the day of the Volcom Pipe Pro at the Pipeline. We rented bikes at the North Shore Surf Shop (an included activity with the tour - no extra charge) and that allowed us to go freely around. We rode up to the surf competition to watch live. The nice part was with the bikes, you were stuck in one spot the whole time. Watched the competition, then rode down the coast to Sharks Cove and Waimea Bay. It was great to have no schedule or "planned activities" when we got there. We had 3 hours to do what we want. Some wanted nothing to do with the surf competition and they could do what they want. Everyone had their own agenda and this tour worked great with it. (For a quick bite to eat, hit up Pupukea Grill. Its a food truck in Sharks Cove with a heavenly flatbread.) 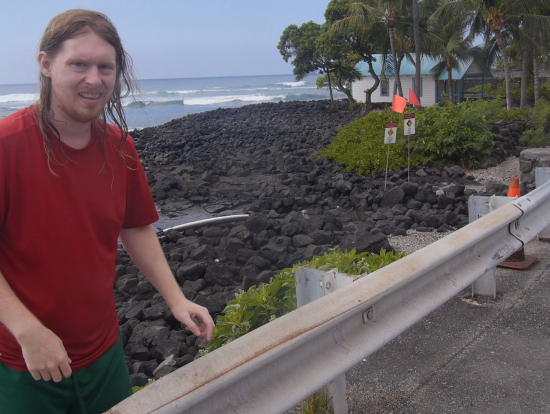 Met back next to Sharks Cove for the bus and rode to Haleiwa for the afternoon. Again, free time through the town to experience the city itself or do water activities at Surf N Sea. We wanted to experience the town, so we went into the surf shops, stores and walked around the town itself. 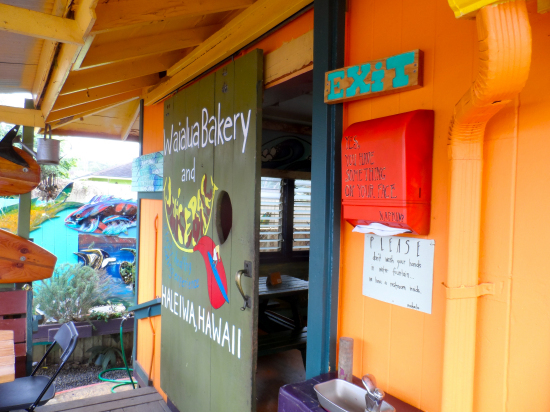 (For a great sandwich, hit up Waialua Bakery and Juice Bar next to the grocery store...phenomenal.) 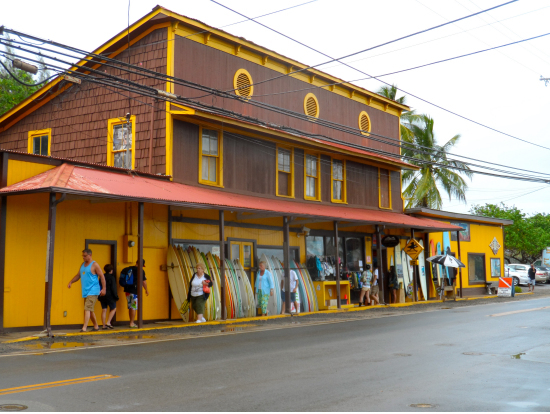 For being a smaller town, Haleiwa is a very cool town to experience. 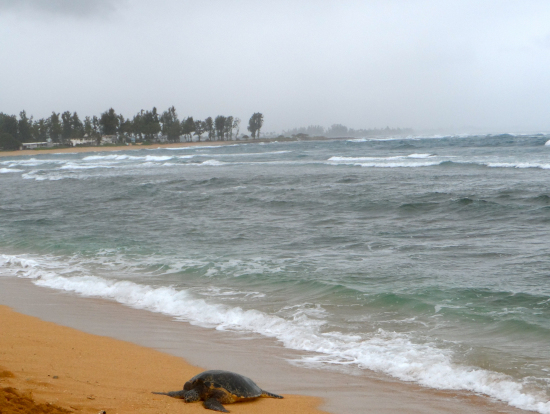 After the town, we were to a beach to view the sea turtles that come on shore. 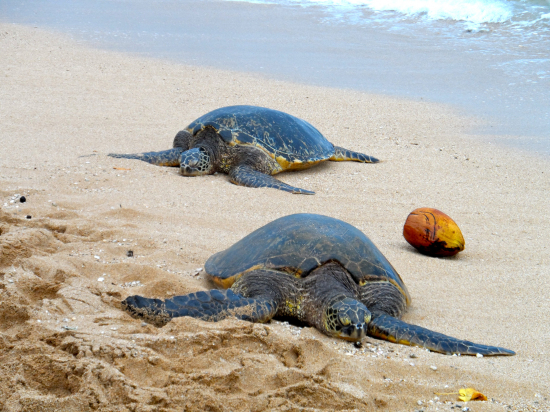 It was amazing to see the turtles that close. For our last full day in Maui, my husband and I decided to book the 10:30 a.m. 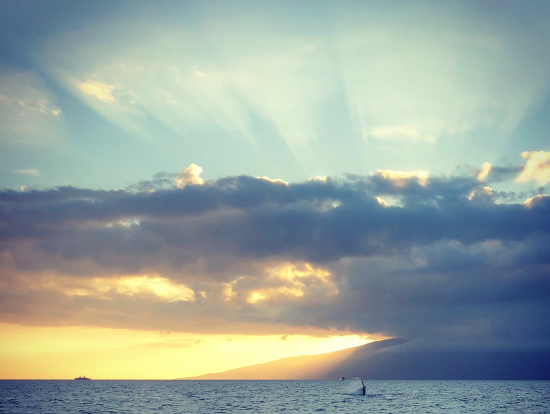 Discover Lanai Sail; what a good choice! From the moment we boarded the boat until the end of the day, the Trilogy crew did everything possible to make sure we had an exceptional experience. There were 5 crew for 50 passengers, so one of them was always nearby. Once we were underway to Lanai, they served beverages, delicious cinnamon rolls and fresh fruit. The humpback whales were very active so the captain did his best to get closer when there was a sighting. As we got close to Lanai, we were surrounded by a school? of spinner dolphins. What fun! 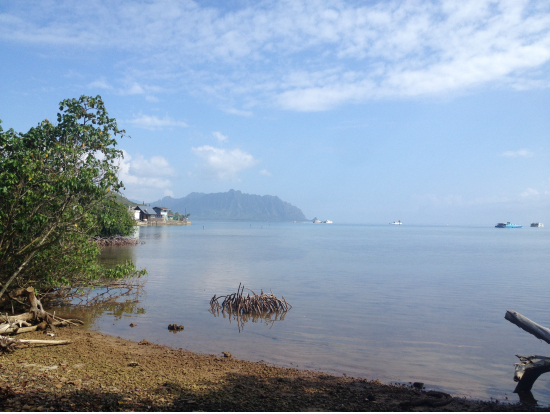 After docking, they took us to the beach — quiet and sandy with restrooms and plenty of shade. Chairs, mats and snorkeling gear were efficiently distributed to get us into the water quickly. There was gentle surf but it was fairly easy to walk in. We’ve snorkeled many places, and this was nice, though not extraordinary. There were many fish, but the variety was limited. 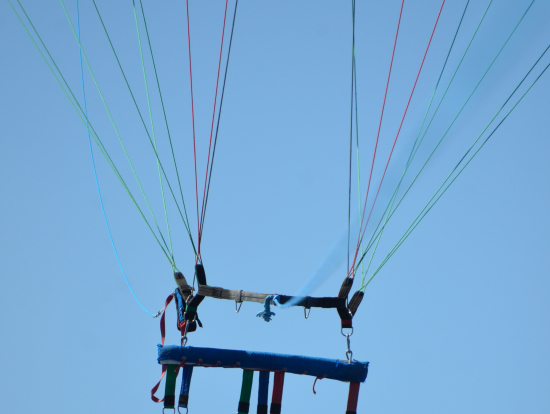 Still fun, and crew were very vigilant about keeping everyone safe. For those who didn’t want to get in the water, (or didn’t stay in very long, like us), there was an island van tour that took about an hour an a quarter. There was no microphone used so I couldn’t hear quite everything, but it was interesting to see Lanai City. At 3:00 we had a late lunch in Trilogy’s covered pavilion overlooking the dock area. Very pretty there. They served healthy and tasty food — tossed salad, noodle salad, corn on the cob, and BBQ chicken. On our trip back to Lahaina (4-ish), the crew opened the bar as soon as the boat cleared the harbor for our trip back to Lahaina. Woo-hoo! Whale watching was even better than it had been in the morning. We also saw two baby whale breeches; what a thrill! This was my first time snorkeling and I came from Canada to visit Hawaii. It was a beautiful experience just because we have a great instructor Mr. Dan through Hawaiiactivities.com. We came to know him through this website. Dan started with all basic instruction and shown all steps for snorkeling in detail. He has snorkeled with us and kept my kids together and safe. 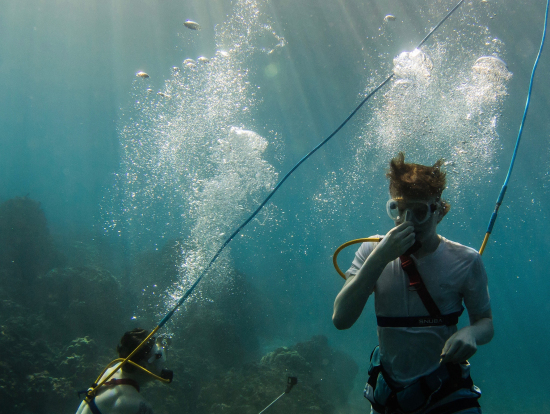 It was a magic day of snorkelling in the biggest coral reef on earth. Thousands of colorful fish in the warm water. Thanks a lot to Dan You're part of memories of a life time. Dan brought all safety devices and snorkeling equipment. He adjusted the equipment to fit very well with each of us. As my kids were not good at swimming, Dan took much patience to train them. He brought mats and drinks to relax before getting into sea. I saw dozens of very large angelfish, parrotfish (Blue, Queen, and Stoplight), as well as many species of damselfish and butterfly fish, Sergeant Majors, Yellowtail Snapper, and I even saw a Longspine Squirrelfish! It was an absolutely perfect day. The water was very clear. At one point I was surrounded by hundreds of fishes all swimming calmly in one direction (schooling). 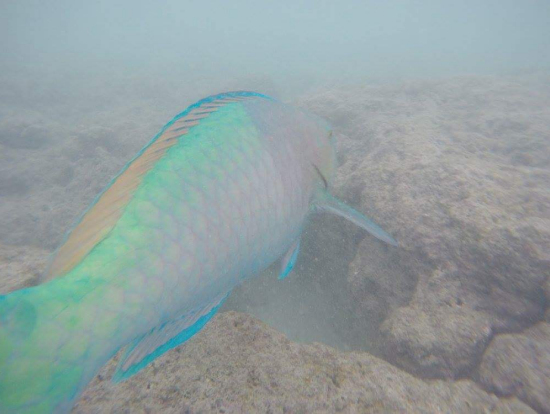 All of a sudden they parted (odd, because I had been swimming with them for several minutes without them seeming to notice), and I saw the most awesome and colorful fish I've ever seen in my life swim 5 ft directly under me! I thought about was how every now and then you hear stories about HUGE catfish the size of Buicks at the bottom of deep lakes. That being said, you can imagine my initial hesitation on the day of my snorkelling experience at I might have started out a little nervous, but I can tell you right now—it ended up being my absolute favorite experience on the trip. Bob and Akima picked us up at 7.25 am outside Hawaiian Prince Hotel, then picked up 2 other groups of 3 making 8 of us. 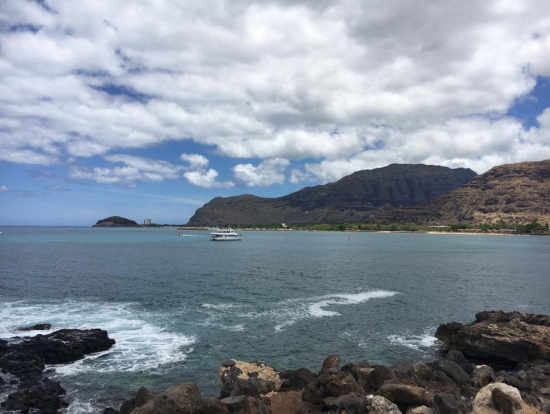 We drove out of Waikiki for around 20 mins with interesting commentary about Hawaii from Akima before reaching our first stop - a beautiful picturesque beach where it"s possible to see dolphins. Akima spoke Japanese so stayed with the 6 Japanese people leaving Bob to me and my friend. Bob told us a lot about the area and if you want to know more about surfing then Bob's your man. We then moved on to a small group of shops where we bought items for our picnic lunch later. We next went to a Kaneana,(Makua cave) a very old sea cave with many legends attached to it. Bob was a great storyteller telling us about the legend of the shapeshifter shark man of Makua cave. 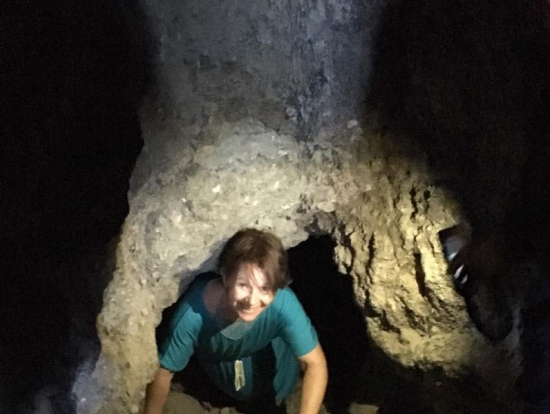 Then you can explore the cave a bit if you dare! 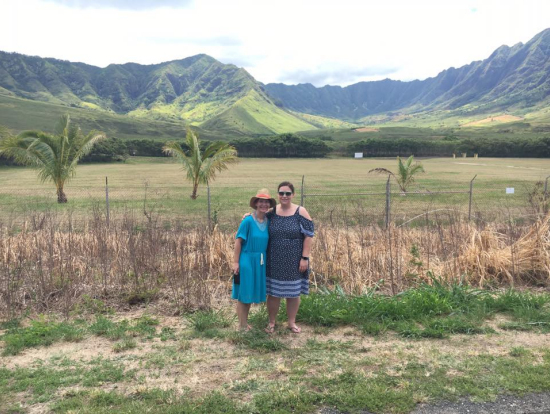 Next we stopped at the stunning Makaha valley which again has a great legend associated with it and looks like scenery from Kong Island or Jurassic Park. 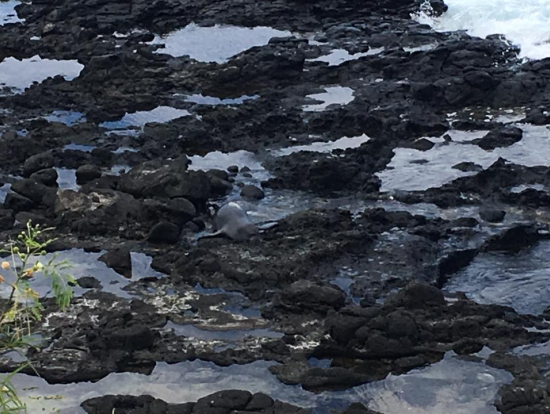 We were really lucky driving to our next spot as Bob spotted a rare Monk Seal basking on the rocks. A couple more lovely spots then time for our lunch at Ku'ilioloa Heiau, and then the snorkelling at Pokai Bay. First Bob checked our swimming ability then gave us mask,snorkel and fins plus a life vest. Bob is very patient and stays with you all the time gently encouraging you to explore the sealife. I'm not confident snorkelling but felt very safe with Akima and Bob. We saw corals, beautiful colourful fish and 2 sea turtles. It was a really great day which we would definitely recommend to anyone wishing to see a much less touristy authentic side of Oahu, the scenery is just beautiful and excellent snorkelling. Many thanks to Akima and Bob who made our day special. Aloha, thank you for your time for review us! We are happy to hear that you enjoyed our unique tour. 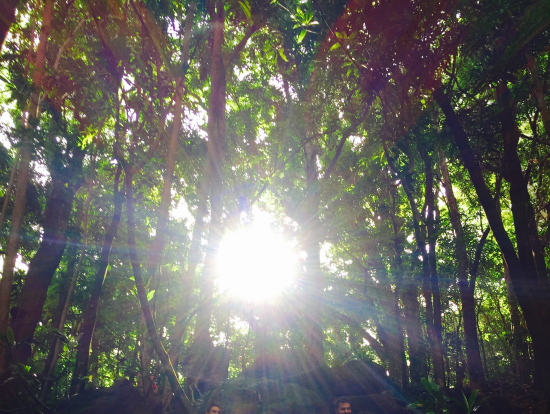 West Oahu is very special place, we are glad you experienced this sacred Hawaiian land. We also do private tour, you ever come to Hawaii, let us take you again! Our family of 6 adults from Brisbane Australia loved this whole day tour. Our driver / tour guide Sam picked us up from our hotel on time, & drove safely. He was so friendly and knowledgeable about Oahu, and explained all the sights on the way to the North Shore - he make the entire trip an awesome experience. He gave us a drive by & quick stop at each of the available activities before we chose them, then dropped us all to our chosen areas. 3 of us chose bike riding along the famous surfing beaches where we could stop and have beach time as we liked; the other 3 the walk through the beautiful gardens to the waterfall. Though a lovely walk, it is quite a long one, for anyone older. If you want a swim at the Falls, take cash for a compulsory life jacket hire! From there we walked back to Waimea Bay beach for a swim until our bus pick up. Our next activity for 4 of us was SUP (stand up paddle boarding) and 2 did kayaking. We LOVED this time on the water and would have liked to have a bit less time on the morning activities and more time for the afternoon ones! After, we walked through the town and sampled the Shaved Ice and some delicious lunch before boarding the bus completely satisfied with our day. 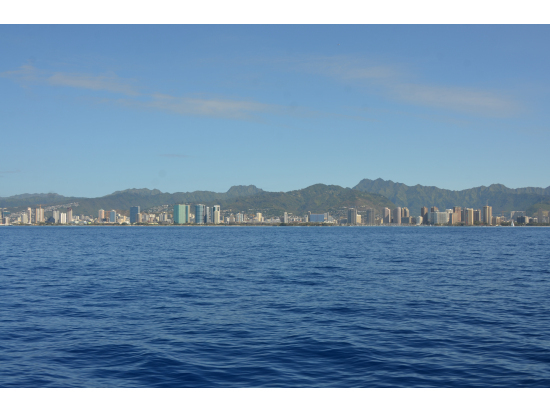 We did several different tours while in Waikiki, and this was BY FAR the very best for the sightseeing, and activities on offer, plus the freedom to have our own time was fantastic. We were REALLY impressed with Sam the driver & happy to tip him well for his outstanding service - he contributed in a big way to making it the best tour during our time in Hawaii. Thank you Sam! I would highly recommend this tour, well worth it and we have great memories of our day. OMG! I had so much fun on this tour. My friend and I were looking for an island that would give us more time to actually enjoy the island instead of being "trapped' inside a bus only taking pictures all day. 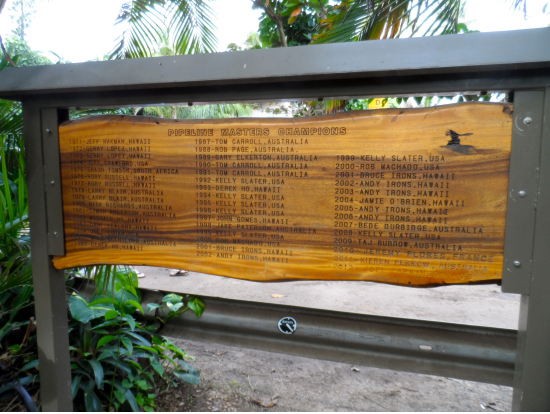 From my research i think this is the only tour that your can visit North Shore & Hanauma Bay on the same day. Perfect for me, since I only had a few days on the island. We were pick-up on time from Waikiki and then we drove straight to North Shore. Our first stop was at Banzai Pipeline, we visited during winter time when the waves are big and were lucky to watch the locals surfing the most beautiful waves I've ever seen. 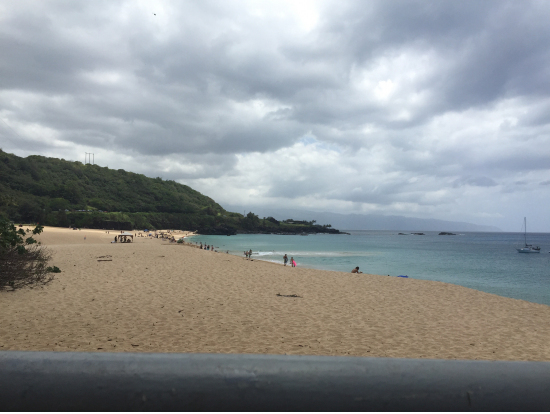 Next, we spent about 1 hour at Waimea Bay where we had time to take pictures, enjoy the beach and body board. For lunch we headed to Tsue's Farms where we had a delicious shrimp plate and got the chance to kayak at a river in Haleiwa. It was so peaceful and beautiful, the river is surrounded by tropical trees and you almost feel like you are in a jungle. The best part? We saw tons of turtles in the river, amazing! We also got the chance to visit at Dole Pineapple Plantation. The guide told us to try the Dole Whip, and it was so good and refreshing. The last stop of the day was my favorite! Snorkeling at Hanauma Bay was the highlight of my trip. I've never swim around so many fishes before, the sea life at this bay is surreal. This tour has it all! Friendly and knowledgeable driver and guides, flexible schedule and tons of things to do during the day. You really get to see the best of Oahu in one day. My day was filled with adventures. Thank you North Shore Beach Bus for helping me to create memories of a life time! It's a Plane! It's a Bird! No!!! 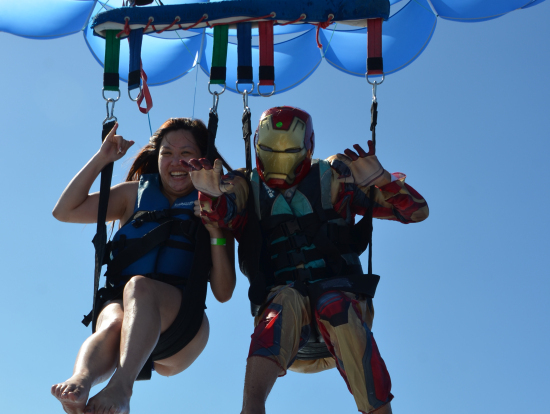 It's Iron Man with Hawaiian Parasail!!! Since I have been let go by Spider Man because he moved on in life recently, I have now been contracted by Iron Man to be his editor and newspaper publisher. 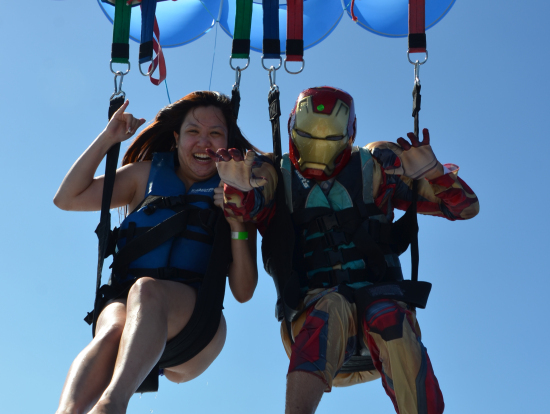 Iron Man had told me that while he is in Oahu, he wants to do something fun and exciting. So I did my research and found hawaiiactivities.com - Veltra. 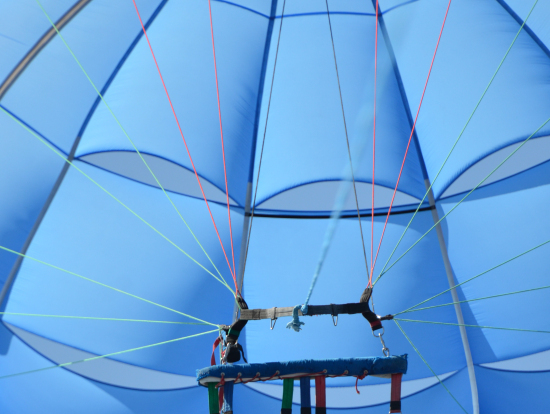 They had great reviews of Hawaiian Parasail and they are the highest ranked for customer reviews! Veltra has a 9:00am early bird special that is reasonably priced, so that is what we booked for. As we checked into Hawaiian Parasail, the reservation agents Loke and Keri were very welcoming with an ample amount of Aloha. They got us checked in and ready to board as we met Captain Jayme and crew member Jason. As we were sailing out to sea, there was quite a bit of nervousness from everyone on the boat. It was everyone's first time, and there was 1 woman who went by herself and she could not swim. 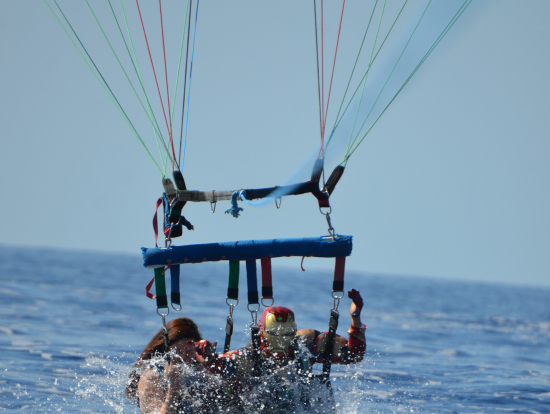 So Iron Man voluntarily flew tandem with her, and I stayed on boat as an observer so Iron Man could save her lonesome day. 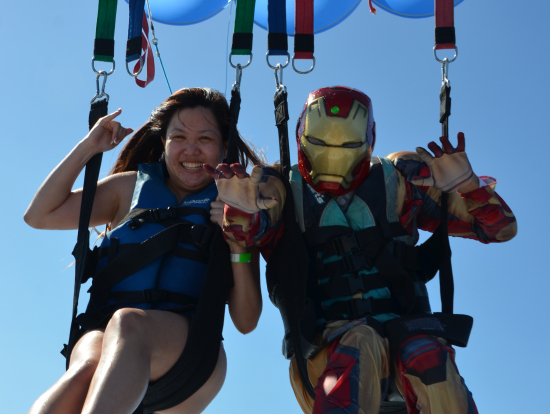 As Iron Man started to get ready to go up, Jason and I were getting all the photos in as we could. Since I am only an editor, my pictures were not of great quality compared to Jason's. It was a smooth ride the whole time for them until they were returning back to the boat. The female started trembling with fear as they started to get dipped in the ocean. Her body twisted as she almost did a 360, until Iron Man caught the line to prevent her from doing so. As we got back to the hut, Keri and Loke displayed their images of Iron Man's event. He saved the day again and he had an amazing time. 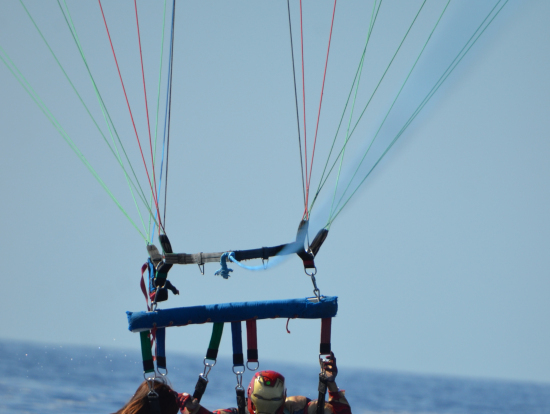 All in thanks to Hawaiian Parasail & Veltra! Iron Man getting dipped again. We could not have had a better morning diving! This was my dads first dive in Hawaii while visiting and we could not have had a better morning diving with Divemaster Red! The first spot we dove for our deep dive was the Sea Tiger ship wreck which sits in about 115' of water yet is only about a half mile out. 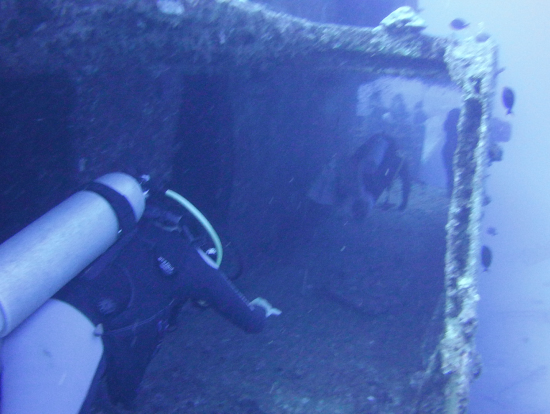 The wreck was full of life. We saw a big sea turtle, eels, a white tip reef shark and many different fish species including a frog fish. Our divemaster Red is insanely good at finding all kinds of difficult to spot marine life. 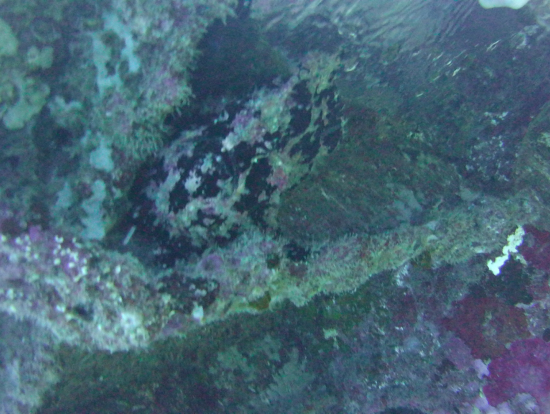 There was also a few spots on the wreck that are opened up and safe to swim through if you are comfortable. The second spot we dove was the old Kewalo drain pipe. The visibility at this spot was absolutely perfect. There were so many different fish swimming around the reef. Red did not disappoint on this dive either! 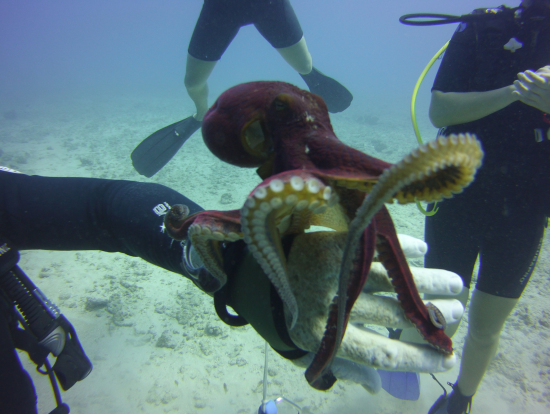 He found a tako (octopus) that we were able to take pictures of. 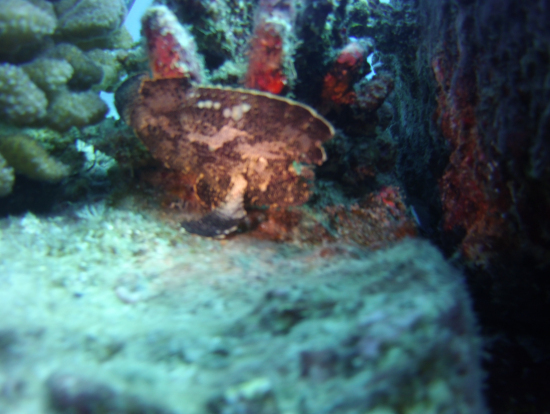 He also found a few other rare, very difficult to find reef fish that I had never seen before! We couldn't have possibly enjoyed our time underwater more! The captain of the boat was hilarious keeping everyone entertained while top side. Due to the proximity of these awesome dive sites to the boat harbor it seemed like the longest amount of time spent on the boat was for our surface interval, which would be nice for those who get sea sick easily. Lucky for us, conditions were calm and perfect and we couldn't have had a better morning of diving. My best advice is to stay close to the Divemaster and pay close attention because they are looking for awesome things to show you that you would otherwise miss. My dad on the deck of the Seatiger. Big turtle below him! I usually don't do reviews because there wasn't enough "wow" or it's special, but not worth my time to "write" about it: This activity is exceptionally the case for shouting about. Think about how in the world could you go underwater, be AMONG fish, not learn the intricacies of diving, not wear heavy equipment on your back (even if weight is not an issue underwater), or hold your breath for an extended period of time, and still be able to wear your personal prescription glasses. This is a great activity to partake in especially for those curious about underwater activities. When you get underwater on these vehicles, a personal diver will be assigned to you to make certain that you're doing OK and to mitigate any problems that may arise---even if you decide to cancel the activity. The hosts were all professional and serious about instructing the group on what to expect while in the water, and I felt comfortable and appreciatead their attention to safety. We rode out to the edge of this bay in the south eastern part of Oahu and proceeded with the adventure in the BOBs plus snorkeling around the boat that brought us out there. One of the divers had a camera to take pictures while we were underwater so there will be pictorial memories to look back at and thoughts about what to do in the future to optimize my excursions beneath the ocean. 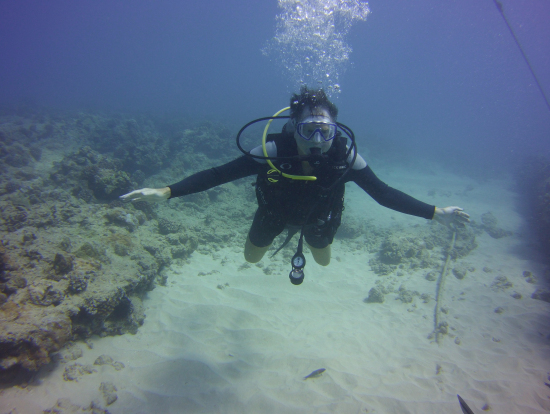 This activity is great!I was underwater for the very first time in my life, and I'm back to write about how great a time I had! 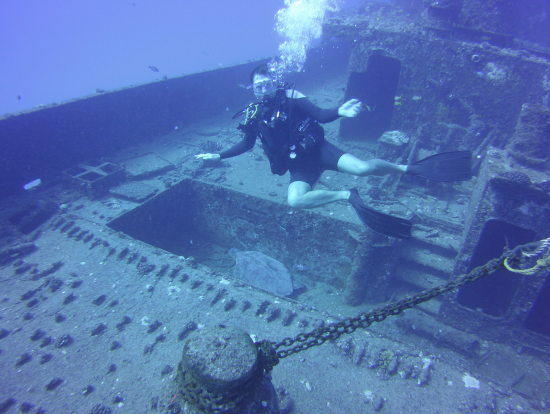 If diving is not for you, try this for your shorter "bucket" list! This was our first experience with snorkeling...but I was convinced that we could not go to Oahu and not see the ocean life for ourselves. Dan and Cheiko were great. We paid for a group of 5 (3 adult, 2 children). We had to pay the full price to have my grandmother brought along, even though she was not participating. With that said it was suppose to be just our small group to the two guides. This was especially important to me as the two children could swim and the adults in our group could NOT swim well. It turned out two others joined us, so Chieko was mostly their guide and Dan was with the four of us. It was raining that day, so my grandmother was not able to come observe (so paid and not used). Although I was not expecting a refund for her experience necessarily, I was a little put off that we were then charged extra for the optional wet suits to keep us warm (given the weather that day). That really is the only thing I would improve, but given the nature of the business, that may be challenging. Otherwise, it was FANTASTIC! Dan was amazingly patient and made the experience great. The children, although swimmers, panicked with the snorkel equipment and sea animals. The adult limited swimmers had a blast! Even on a dreary, rainy day. LOL! they took awesome pictures that we were easily able to download from their social media page, so one less thing to worry about doing especially given first time out. I would definitely recommend this experience no matter what skill level, it will not disappoint. Hi guys, hope we see you again on a nice sunny day. Dan and Chieko. Thanks to Hawaiian Parasail our entire family of four had a fantastic bonding experience on a breezy September Saturday afternoon. What a unique way to spend quality time together--up in the air overseeing the entire city of Honolulu while watching fish passing right under us in the crystal clear Hawaiian waters. We had celebrated our younger son’s fifth birthday the weekend before, and taking him parasailing was definitely the best gift he received. In fact, he was waiting for this day since he was two! 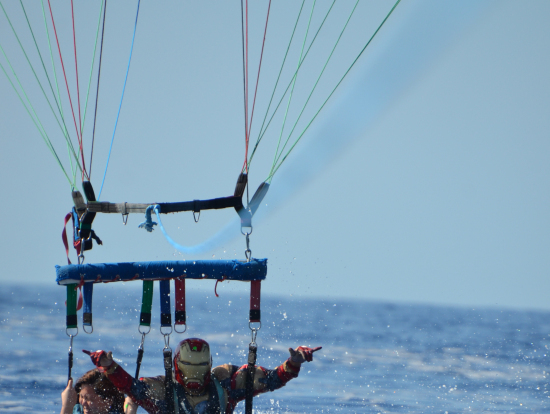 We moved to Hawaii almost three years ago, and ever since then, my little Daniel was dreaming of parasailing. Due to the age restrictions, however, we had to wait till he turned five. So, just a few days after his fifth birthday, this boy’s dream came true. I would definitely recommend this experience to others. The captain and the crew were very professional and friendly. They took pictures of us that I will frame and put up on the wall in our living room. What unique shots! We received detailed instructions on what to do, and by the way, for the Japanese travellers, there is a Japanese safety briefing in their own language. The feet dip is a must! The captain is very sensitive and if a guest asks not to be dipped, he will follow the instructions 100 percent. My boys were not scared of being dipped at all, and as soon as we came back to shore, both of them asked when we would be able to repeat the adventure! 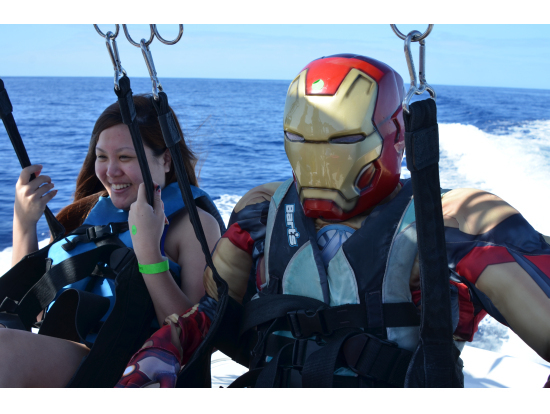 Thank you, Hawaiian Parasail for giving us these unforgettable memories. I wanted to head out to the North Shore, but did not want to sit on a stodgy bus all day and listen to someone drone on and on. The Surf Bus was the PERFECT choice since I not only got to experience the highlights of the area, but got to do some fun activities as well. 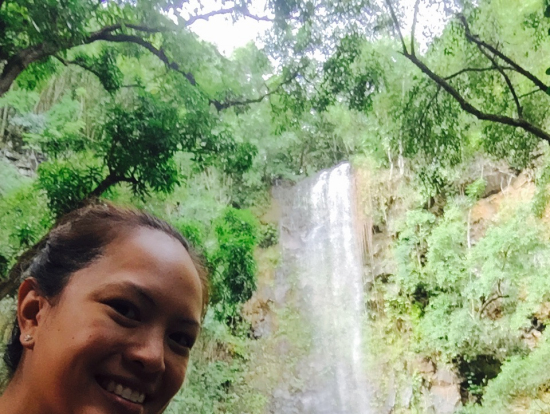 I decided to do Snorkeling, the Waimea Falls nature walk and SUP. Harry was very accommodating about squeezing in two activities for the morning section, and I am so happy that he did. The snorkeling was AMAZING! It was literally like swimming in an aquarium. 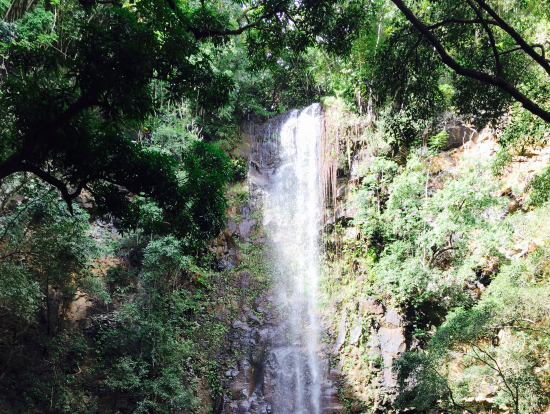 I got to be in the water for a little over an hour and then I was picked up to go to Waimea Falls Park. The walk was quite easy, and if you have a hard time walking, shuttles are available for $10 round-trip at the park. I didn't go into the water since I just wanted to sit and relax, but the walk to and from the waterfall was about 45 minutes total. REALLY beautiful. For my afternoon, I chose SUP and even though I had never done it before, I figured it out pretty quickly after the briefing from the guys at the surf store. 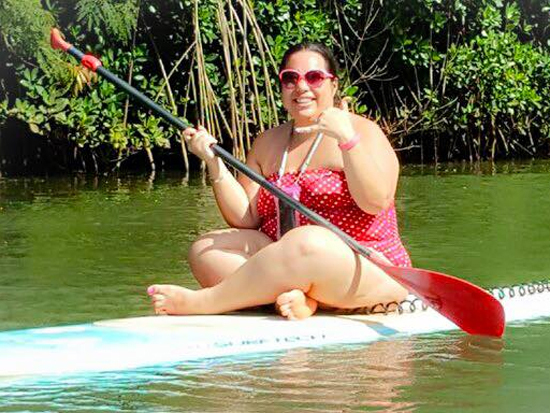 I never quite made it to the "stand up" part of "stand up paddling", but my "sit up" paddle was just as fun and I made it all the way down the river. At the time we made this reservation my wife and I did not realized that this would be a best thing we did on our vacation. From the moment we met our Guides, husband and wife Kevin and Noni O'Conner we were treated with such care and attentiveness to our requests and needs during the whole trip. I would highly recommend that anyone interested into snorkeling on Big Island to look for King Kayak Tours. To start with they specialized in small groups tours, that day it was only us!! 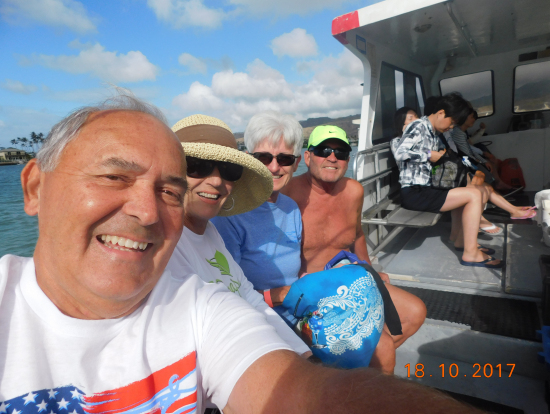 We enjoyed this trip a lot more that any other snorkeling tours that we were on previously. Location where we did go was close by to our launching point, we had seen a lot more tropical fish and turtles that anywhere else. Equipment was a top notch, snacks provided during the tour ware excellent and plentiful. We absolutely love it, and this would be one of the tours that we would do it again just to be in such a great and knowledgable company such is Noni and Kevin. Added bonus is that they bout are fluent in Japanese, and are offering tours for Japanese speaking tours as well as for English speaking groups. For Laura and I this was such a special treat since it was our wedding anniversary that day end memories that were built during this tour will stay with us forever. Another note, don't worry about photos during the tour they have great camera and they will be taking photos of you so you could focus on enjoying your self. Once again thanks so muck Noni and Kevin for making our Special day even more Special!! Thank you so much for your kind words. We are very happy that you both had a good and memorable time. We hope to see you again! Aloha! Our family of six (6) spent ten days on the Big Island. On Friday morning, one of our three boys told us how cool it would be to learn how to surf. That was all the incentive his mother needed to commence her Google search for the best firm to school her three sons (ages 22, 26 and 29) on surfing. She started calling on Friday morning at 8:00 o’clock with all of the places informing her that it would be Monday before they would have a spot for the three boys. The lone exception was Life Guard Surf Instructors. This family owned surf instruction firm took the information about our three (3) sons and arranged to have another instructor come in to give our sons a group lesson, which occurred within three (3) hours of when we initially called. When we arrived they receive a thorough briefing about what was in store for everyone when they got into the water. This was extremely important since one of our sons has some learning difficulties and is very uncomfortable if there are things that he will be expected to do and he is not warned about them in advance. When we reached the place where the water instruction was to take place, to our surprise, our son who has the learning difficulty was given one on one instruction from one of the Owner family members. He thoroughly enjoyed himself. Our other sons also had a great time. We would highly recommend Life Guard Surf Instructors to everyone who wants their children to be instructed by highly trained and caring instructors. On behalf of our entire team here at HLSI. Thank you taking the time t write a review and share your families surfing experience with others. We pride our family owned and operated surf school on our customer care and satisfaction and number 1- their safety. Sharing our love for the ocean with others is what our surf school is all about! Thank you guys for choosing HLSI for your surfing adventure here in Kona. Aloha! 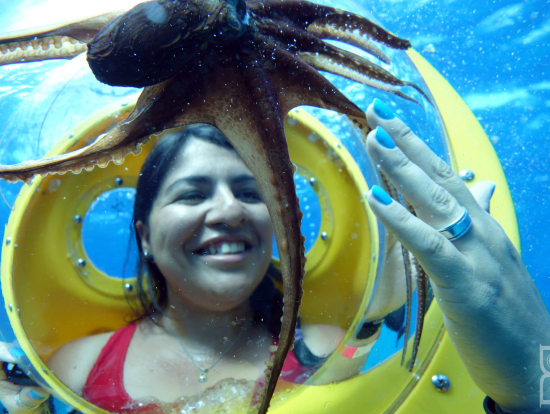 All-in-all, I recommend this tour from Waikiki Dive Center. They have great instructors! When I first walked into the dive shop it was fairly clean, but a little disorganized. The displays were a little difficult to reach and could be made better by putting out a single style and have customers ask for a size from the stock to sell in the back. Everybody there was pretty nice, and very laid back. It was busy so I could understand that things were running late. Once we got our gear, our driver Waylon took us to the boat at Kewalo Basin. He was friendly and nice to talk to but this is for scuba diving so don't expect a flamboyant tour bus operator. The initial instruction was done by Gracie. She was really nice and did a great job at explaining things to keep everyone safe and having a good time. This was my first time and I had a little anxiety, but the breathing in scuba diving really is like yoga breathing. It was very calming, a different world in the ocean. I kind of felt like an astronaut. We had two dives, and everyone was very helpful in instructing us. Lacey worked with my group. She was nice and very much about safety for us newbies. We saw all kinds of sea critters. I took it easy and did the 'yoga' breathing and it turned out quite well. 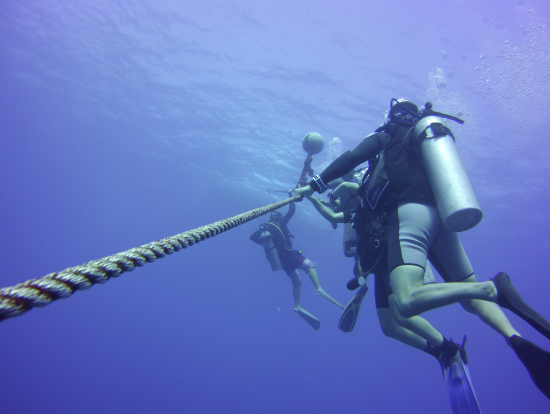 If you want your scuba certification, Waikiki Dive Center is a great place to get it. This first intro dive counts towards it, so you're practically half way there already. Nice people + Nice scuba diving = Awesome! Awesome experience and a fun new skill gained! I've always wanted to learn how to surf and Jason was totally awesome and fun to work with. Although there were high surf warnings and strong current warnings going on at the time, I nailed a perfect 10, according to him, on only my 5th wave. I later got 3 in a row, including standing up, surfing the wave, and laying back down again without falling in the blue water below. I quickly caught on to many of the trends, such as interpreting the waves and knowing when to go for it. The first thing to do with learning most any skill is to find patterns. Jason called me a natural at it, and I believe it, given how quickly I learned and how enjoyable my experience was. It did take me a bit of time to get used to getting up to the standing position from laying down, but the classroom-like aspect of the first segment really helped with that. I would say the hardest part about this whole thing was finding a parking space for where you'd be doing the actual surfing itself. If you're lucky, you could find parking along the street close by, but chances are, you'll need the parking lot that's close to around 700 feet away, but what's a little walking when you've got a lot of paddling to do? It's a nice warm up, at least, to prepare yourself. I chose the one on one option mainly because I felt it was going to be a skill I wanted to use in other locations. Little did I know, it actually ensured I could do this as everyone but me canceled due to the surf conditions. A great day kayaking and hiking to Secret Falls! My husband and I had a great time on this excursion. We were the only ones signed up for our particular day and time so it ended up being a private tour which was a bonus. We had the morning tour (check-in at 7:45 am) which seemed a lot less crowded than the later tours. There were a lot more people hiking in on our way out. The activity was very scenic and not strenuous at all for us moderately in-shape people (my husband more so that me!). Jamie was an excellent guide. He was knowledgeable in the flora, fauna, and area, but also personable so we weren't talking shop the whole time. Lunch was also more than adequate: fresh pineapple, deli sandwich on a good roll with cheese, lettuce, tomato, mayo, mustard, a bag of chips, 2 Kauai cookies, a drink, and 2 bottles of water. Since we took a guided tour this time, the next time around we'd probably opt for renting kayaks on our own and making our way to Secret Falls without a guide. We definitely want to do this again with our children when they are a little older (at least 5). 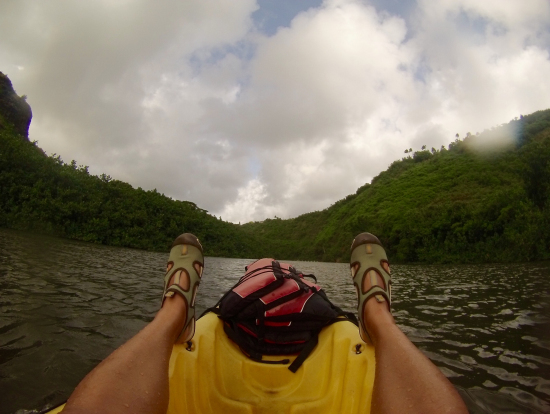 However, for first timers we highly recommend Kayak Kauai with Jamie as your guide! P.S. I would not recommend this tour for children younger than 5. It is very rocky, muddy and wet with lots of tree roots on the trail and by the waterfall. 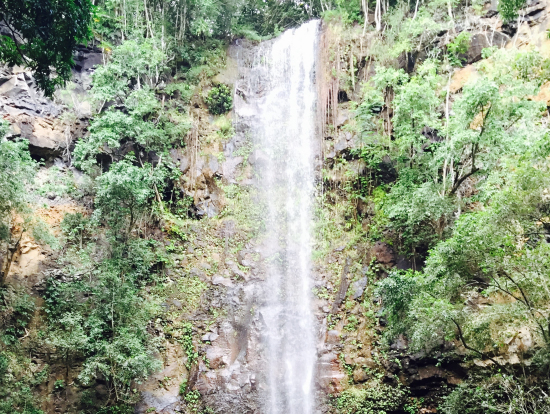 We saw another tour group with young children and several of them were crying because they fell on their way down to the waterfall. One small boy fell and hit his head on a rock, poor thing. This kayak trip was awesome. 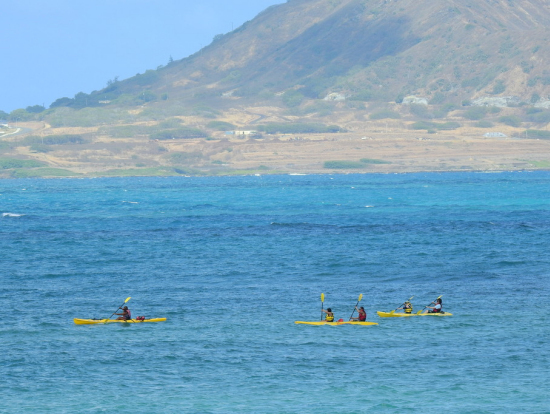 I booked this tour since I heard that snorkeling is awesome in Kaneohe, and I wanted to get away from busy Waikiki. I was picked up from my hotel in Waikiki in the morning, and once we got to the state park, we were greeted by friendly staff at their gift shop where we checked in. Make sure you bring your insect repellent. I got bit by mosquitos a few times. 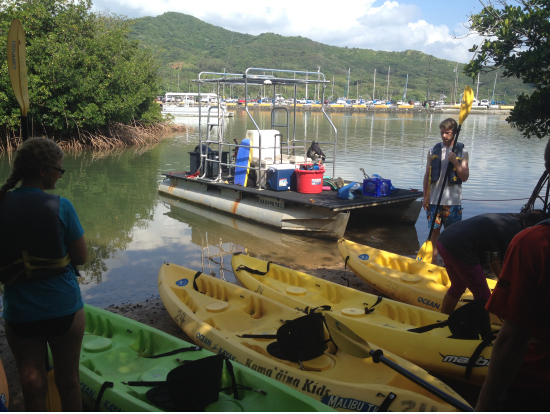 Once we were briefed and went down to the launch pad, our kayaks were tugged to the boat so we didn't have to kayak all the way to the first snorkel spot. The guide dropped us around the half way, and we kayaked about 15min to get to the Coconut island. The coral was BEAUTIFUL and there were a lot of tropical fish. After 30min or so, we were then tugged again to the 2nd location. It was awesome since we were already a little tired from snorkeling. I liked the 2nd location at the sandbar, and this spot was also beautiful. 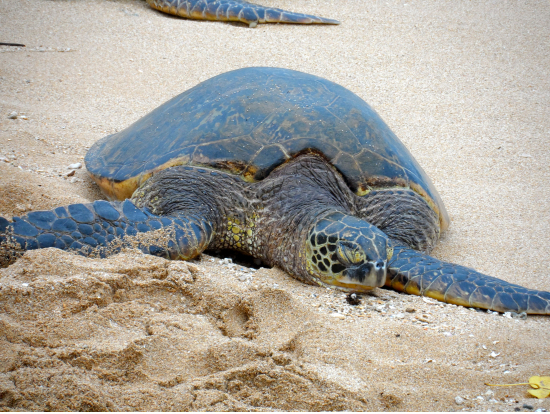 The other snorkelers spotted a huge sea turtle. We then had a chance to choose if we wanted to kayak back or tugged on the boat again. I chose to kayak back, and it was a perfect amount for kayaking for a day. They had a fresh water shower at the park, and they took us to their BBQ lunch spot where we had a chance to eat delicious lunch with their staff. Overall, this was a great tour. Especially recommended for families with small children or older people who can't kayak too long. Tugboat was awesome. I went to visit Hawaii with 3 kids, 10, 11, 14 and did 8 hrs private tour. I would like to say that it was the most amazing tour I have ever done in my life. From beginning to the end, all of us were excited and were having so much fun. First, we did snorkeling at Hanauma bay. Guide ( so sorry I forgot his name.....) was so patient with all kids (it was a first time snorkeling for most of us). He taught us step by step and made us feel comfortable in the water. We got to see lots of colorful fish and had lots of lots of fun. Mark took us amazing real Hawaiian food restaurant! We got to experience cool food there!! 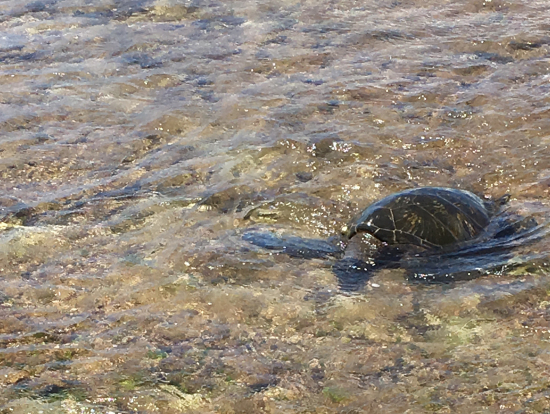 We could not see sea turtles at Hanauma bay but Mark took us to the beach where he finds sea turtles often. Well, we found 3 of them! It was so amazing to see them and my dream came true!!!!!! We all thank to both guys who gave us an amazing experience in hawaii, we learned so much about hawaii history and many stories about hawaii. We would love to do this again next time we visit there for sure. 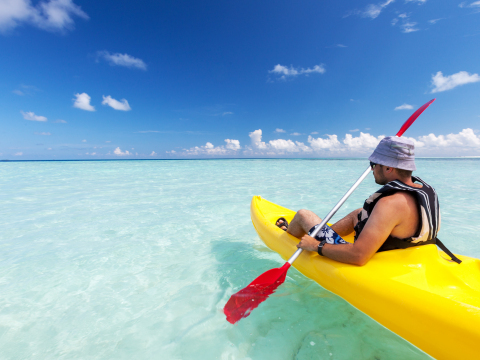 Kayaking on the ocean with Kailua Beach Adventures might be one of the best activities we did for our honeymoon. Our guide was very knowledgeable about the area and give us some great information about the culture and islands. My husband and I both have done kayaking before, but has never done it in the ocean. There were some waves and it can be a little challenging for those who have never done kayaking before. One thing to be prepared is some labour work. You need to drag your own kayak to the ocean with a cart they provide. You also need to drag it back. It was not super far, but definitely energy consuming. Most staff members are very friendly. I had a little hard time jumping into the kayak with the waves, the person looked a little annoyed with that and had a bad attitude. She might just be having a bad day. During the kayak, they have professional photographers taking photos of your group and you can purchase them at the end of your tour for $39. There were about 40 in the package. The lunch coupon gives you three or four lunch choices nearby. Mostly box lunches or pizza with a drink. I forgot one of my my shopping bags at their shop and called them the next day, they had it sent to my hotel, which was very nice! We had an overall wonderful experience. We will definitely do it again given the chance! Who said that only swimmers can go under the sea?? First I was really afraid because I can barely float, I don't swimming if is not at the pool and going short distance. But I decided to have a new experience as a solo traveler in Hawaii as my first visit. The crew were just amazing, the lady at office received me with a big smile and was very friendly. The rest of the crew really made me feels good and my fears went away. When we got to the spot in the sea the first animal I saw was a turtle, and was an amazing feeling. While the crew organizing every scooter the only thing in my mind was "oh please I don't want to be the first one", after the captain told me I will be the next, I ended up being the third person going under. Words can not explain, you really need to go and have this experience where you can actually be close and touch animals under the sea. I was lucky enough to see turtles, different kind of fish and even an octopus that got stuck on my big helmet for my pictures and video. I really recommend BOB's Adventure underwater scooter, specially if you don't swim at all, like me. PS: I took the bus to get there from downtown, the commute was really easy and you will get so see more. My wife and I were staying in Waikiki for a week and everyone said we need to make a trip to the North Shore when on Oahu. 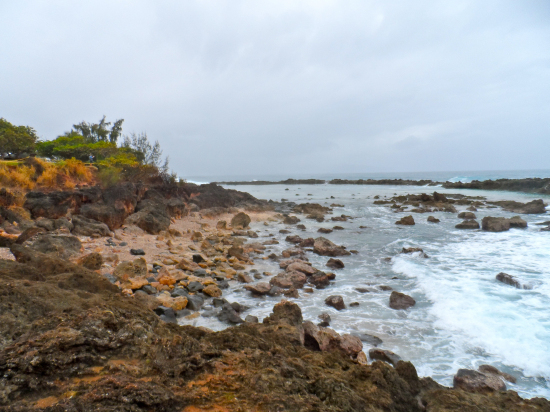 We scoured Trip Advisor, Yelp and other Hawaii Adventure sites and this one looked appealing. Turns out to be a great deal if you are looking for transportation to the North Shore and a variety of options to choose from once you get there. 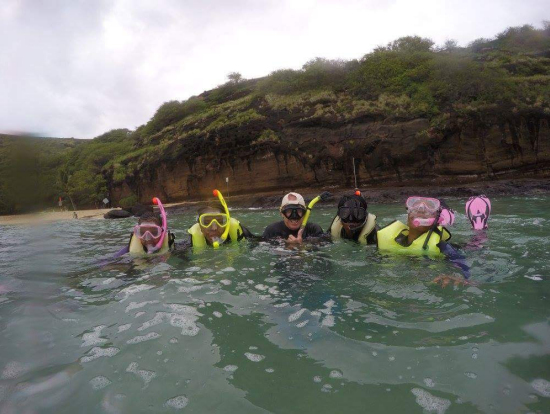 We chose to snorkel in the mornng at Sharks Cove then spend an hour at Waimea Bay, then in the afternoon we did the SUP down the river in Halewia. The tour is setup where they pick you up on a ~20 person bus from multiple Waikiki hotels, then up a narrated drive up to the North Shore which took about 1 1/2 hours all together. Sam was our host for the day and is awesome at his job. Very knowledgable, humourous and makes the tour a good time. 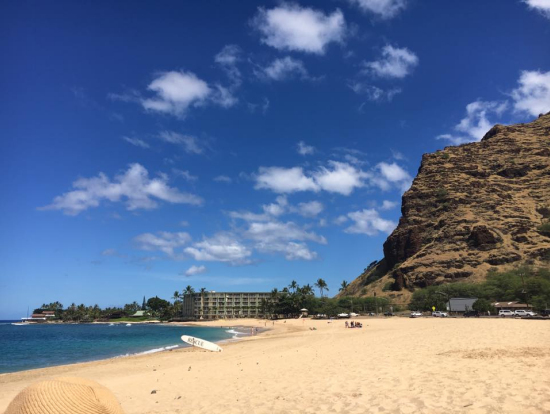 Once you are there, you get to see the options for the day such as hanging at the beach of Waimea Bay, surfing, snorkeling, beach bike cruise, Waimea Botanical Gardens, stand up paddle boarding and probably a few others options that I am missing. There is no additional cost to do these unless you want to do more than two. If there was one draw back for the day, it was that we could have enjoyed a few more hours on the beach and shopping at the local surf shops there. Overall, great trip and glad we did it! We had the pleasure of spending the day with our tour guide, Sergio. Pick-up was prompt at the exact location. 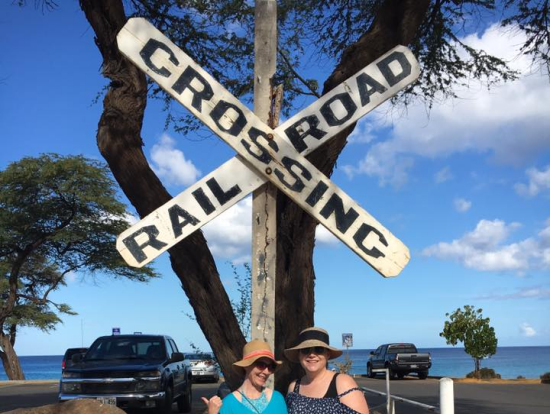 The drive to the North Shore was informative with lots of facts about Oahu. We had a short stop at a coffee shop on the side of the road - excellent coffee! 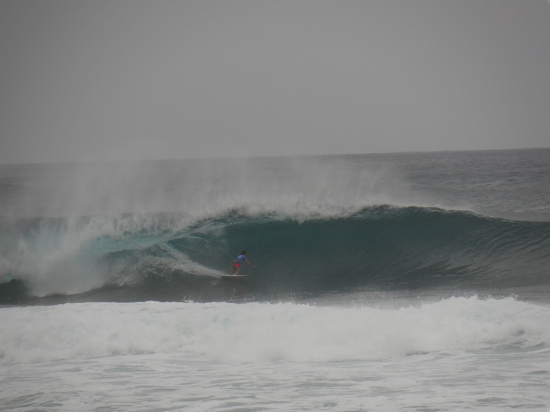 We then made our way to the North Shore and happened upon the Van's Triple Crown of Surfing! We spent an extended amount of time there watching surfers from around the world. Sergio then took us to the Pipeline. After a brief stop at the Pipeline, we stopped for lunch and paddleboarding. Lunch was amazing - shrimp, rice, and salad - and the shrimp were huge! Following lunch we went paddleboarding (kayaking was another option). There were turtles swimming in the river right beside us. Following lunch/paddleboarding, we stopped at the Dole Plantation which has everything pineapple you could imagine. The Dole whip was delicious - a must have when stopping there. 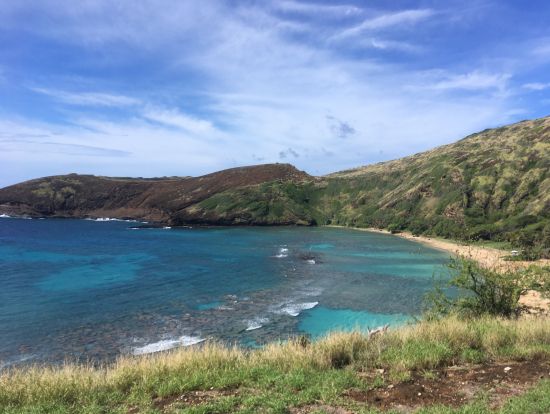 After leaving the Dole Plantation, it was about an hour drive to Hanauma Bay (a state park) where we went snorkeling to wrap up our day-long adventure. Snorkeling was delightful - the fish were huge and couldn't have cared less that we were there with them. If you're looking for something to do and don't want to fuss with details, this excursion is a great choice!